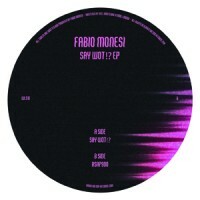 Wilson head honcho Fabio Monesi has quickly carved out a solid rep through unique, ruff-n-ready releases that land somewhere between vintage, dusty Chicago house and analogue-driven hardware techno, possessing a wild energy and fiery mood. No. 18 on his label and the London-based DJ / producer presents two inimitable tunes - full of acidic bass, mainline drums, rampant perc and warehouse friendly goodness. I often think Monesi characterizes what it must sound like to frequent the modern day acid house squat scene of east London and this record hammers that idea home even further. Matt says: The Italian stalion returns! Two tracks of squat party thrust locked n loaded.